Editor's note: We originally ran this feature about the iPad on its January launch date. Given that April 2, 2019, is the ninth anniversary of the original iPad, today seems like a good day to celebrate the device again. Three days before the iPad was announced, Microsoft's then-CEO Steve Ballmer even unveiled three such slate PCs. He did so in his typical hesitant, clunky style and launched a video that was over practically before he'd introduced it. Given that and the way he belabored that all the slate PCs he showed were prototypes, it all felt a little desperate. Apple was coming, it seemed to say, and rivals were afraid. Microsoft, for one, should really have been feeling chagrin. As far back as 1996, its founder Bill Gates wrote in his book The Road Ahead that "in the future lots of people will be taking handwritten notes on computer tablets rather than paper." True, by then we'd already seen the Apple Newton so Gates's book wasn't as visionary as it seemed to think. However, Microsoft had done more than talk about tablets, it had released Microsoft Windows for Pen Computing in 1992. Then by the early 2000s, companies were making Pocket PCs. Microsoft had tablets long before Apple. Many, many companies had tablets. It was just that nobody was buying them. So this is where we were in early 2010. 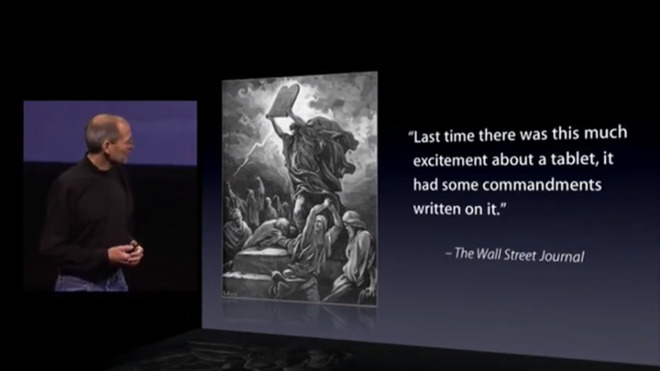 The entire computing industry was waiting for an Apple tablet, the world's press was going to cover its launch. And then, as now, Apple didn't say a word about what was coming. 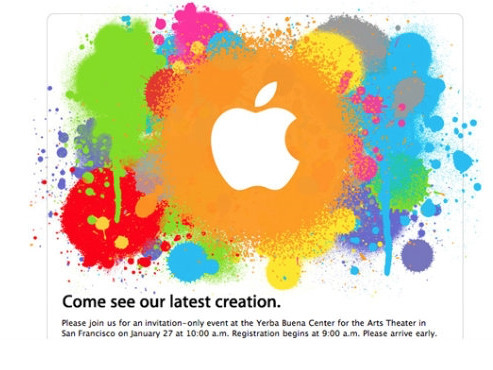 The earliest official indication of something, anything, happening came on January 18, 2010, when Apple issued a press invitation to the launch. It was less cryptic than usual as it blatantly said: "Come see our latest creation." 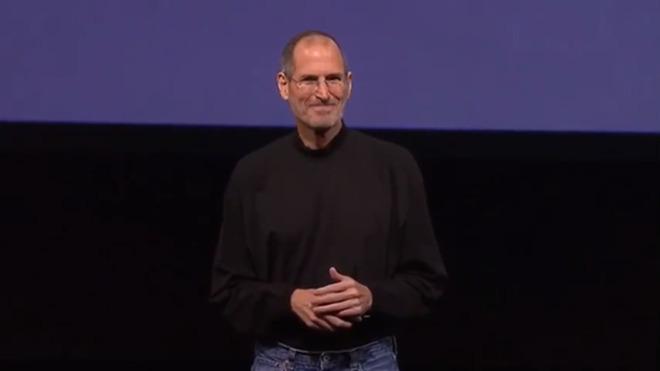 At 10am Pacific on Wednesday, 27 January, 2010, Steve Jobs stepped out onto the stage at the Yerba Buena Center for the Arts, San Francisco. He didn't pause the way he had with the iPhone three years before. He didn't say that this was a day he'd been waiting for. Yet he could have done because as we found out much later, the story of the iPad began much earlier. It began earlier even than the iPhone. You know that the Newton was Apple's first tablet computer, albeit one that needed you to use a stylus instead of your fingers. It's debatable whether there is really a line from the Newton MessagePad to the iPad but if this were a case of evolution, we've found the missing link. 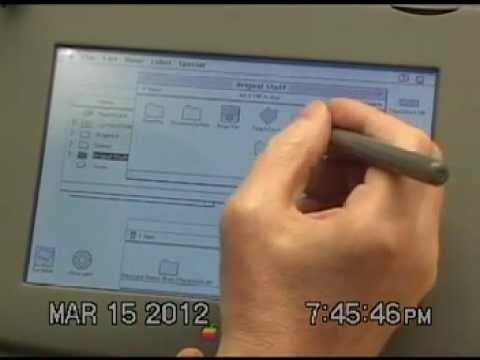 That 2012 video is a demonstration of a pen-based Mac that was made around 1992 but never shipped as a commercial product in the US. It was called the Apple Penlite and the version shown here is a stylus-based tablet version of the Macintosh PowerBook Duo. Reportedly, though, there was also a version that ran with what we would now call multi-touch gestures. Apple dropped that and it dropped the Newton but in 2004 Steve Jobs revealed that Apple had continued looking at a PDA. "We got enormous pressure to bring back the Newton or do a PDA and we looked at it," he said at the D2 All Things Digital Conference. "And we said, wait a minute, 90 percent of the people who use these things just want to get information out of them, they don't necessarily want to put information into them on a regular basis. Cellphones are going to do that." At the time, he said this as if that were the end of it, that cellphones were a market that Apple could never compete in. Yet by this moment in 2004, Apple had produced a technology that would end up becoming the iPhone. It's just that it wasn't looking at a phone then, it was looking to do a tablet. 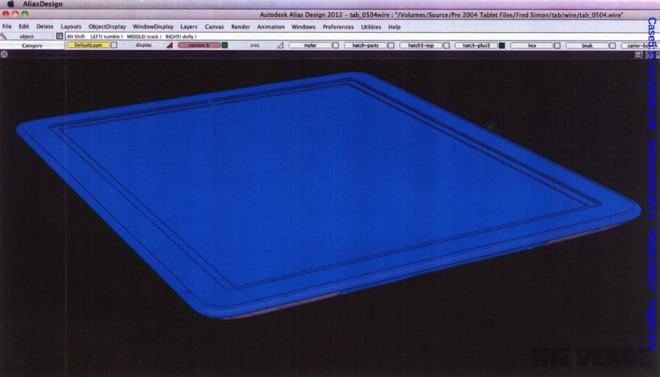 That image and others were later to be used as exhibits in an Apple vs Samsung court case where we also saw photographs of later prototype iPads. It's odd just how unclear and uncertain the origins of the iPad are given that it and the iPhone are so important to Apple and that none of this was so very long ago. Yet while the CAD drawings show a date of 2004, Walter Isaacson claims in his Steve Jobs biography that the idea for the iPad didn't come until 2005. Even then he recounts two different versions. One is that Jony Ive and his team had been working on improving the trackpads of the MacBook Pro when they developed multi-touch. 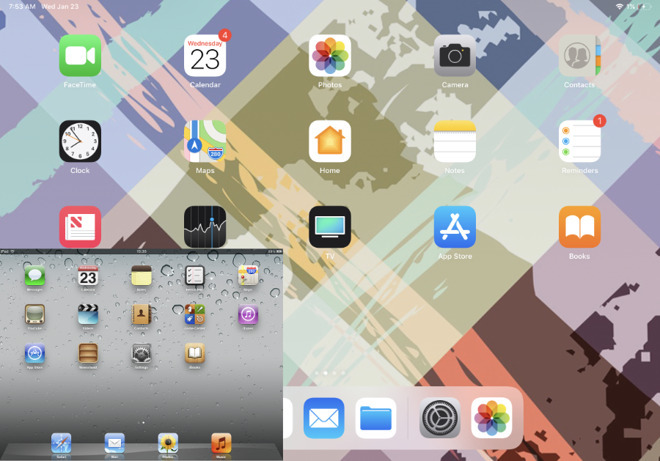 Ive showed Jobs a version of their attempt to move multi-touch onto a screen. 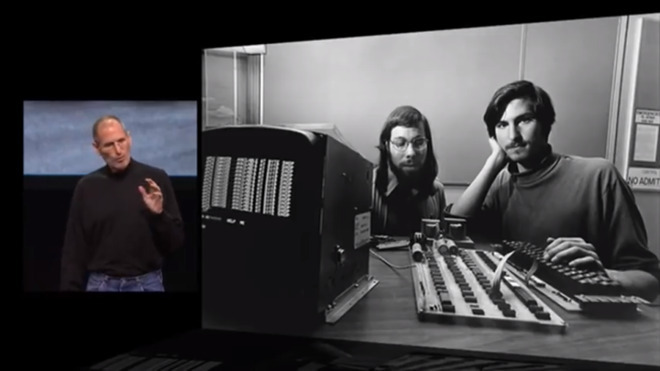 Isaacson reports that Jobs then said that "this is the future." Alternatively, Isaacson also recounts a version that sounds more colorful and apocryphal but which he backs up with quotes from Jobs and Bill Gates. Reportedly Gates and Jobs were at a dinner party for the birthday of a Microsoft engineer who, says Jobs, "badgered me about how Microsoft was going to completely change the world with this tablet PC software." Apparently this wasn't a new topic for this unnamed Microsoft engineer -- "this dinner was like the tenth time he talked to me about it" -- but each time the conversation was about using a stylus. "But he was doing the device all wrong," continued Jobs. "As soon as you have a stylus, you're dead... I was so sick of it that I came home and said 'F*** this, let's show him what a tablet can really be.'" What is clear that this work to make a tablet was changed into making a phone. We know this from how Jobs, Ive and others have said so, but also from the fact that it happened. The iPhone came out in 2007 and it wasn't until 2010 that the tablet appeared. It's not as if the road from idea to tablet was easy but once the iPhone was done, and also was such an overwhelming success, the iPad was at least more assured. Except that Apple was new to tablets and so many other companies had tried and failed. 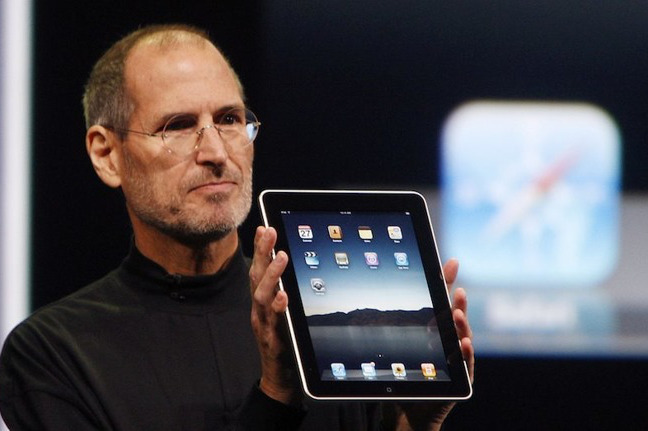 The iPad's success was of course going to be down to its technology but also very much to how Apple positioned it. 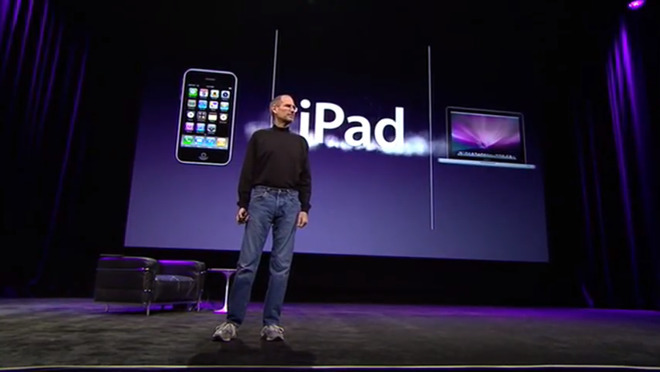 And as much as unveiling the hardware on January 27, 2010, Jobs was really selling us on the idea of an iPad. Steve Jobs got a standing ovation when he stepped out onto that Yerba Buena Center for the Arts stage and he got it before he even said "Good morning." He got the welcome because this was his public return to Apple after having taken six months leave while recovering from a liver transplant. The extent of applause did seem to surprise him and he did still look ill, but he was soon into a very astutely prepared presentation. Twice he teased about being there to show us all something new and then instead said he wanted to tell us other things first. He gave a typical update on the state of Apple and of course the numbers were impressive, or at least they were at the time. While they've now all been dwarfed by the company's later success, in January 2010 Jobs was able to report that the company had sold its 250 millionth iPod. He was able to say that there were 284 Apple Stores and that they'd seen 50 million visitors in the last quarter. He could tell us that there were now over 140,000 applications in the App Store and that they'd been downloaded over 3 billion times. It was all the regular stuff but in this presentation it was specifically laying the ground work for how Apple was the company to deliver a tablet. How it was the firm that would of course get this right. After the numbers about the stores, Jobs showed an image of himself and Steve Wozniak from the earliest days of Apple and then paused. "We started Apple in 1976," he said. "Thirty-four years later, we just ended our holiday quarter, our first fiscal quarter of 2010, with $15.6 billion dollars of revenue. That means Apple is an over-50 billion dollar company. Now, I like to forget that because that's not how we think about Apple but it is pretty amazing." It was also the cue for him to expand on the revenue number, to talk to us about how Apple gets this from three product lines. Those were the iPod, iPhone and the Mac. "Now what's really interesting about this is that iPods are mobile devices," he said. "iPhones are mobile devices. And most of the Macs that we ship now are laptops. They're mobile devices. Apple is a mobile devices company, that's what we do." Remember that competitors had been making tablets for at least a decade. Here was Steve Jobs saying that Apple was bigger and better than them all. "It turns out that by revenue, Apple is the largest mobile devices company in the world now." He belabored the point, driving home that Apple was larger than Sony -- or at least that company's mobile devices business -- and the same with Samsung and Nokia. With us all now fully briefed on Apple's stature in the mobile devices market, he finally went into the iPad part of the presentation. Or appeared too. "But before we get to that," he said to laughter, "I want to go back to 1991 when Apple announced and shipped its first PowerBooks." Now he was underlining Apple's hardware expertise and how it led the industry. He spoke of how the PowerBook made the laptop into what we now recognize as one. "It was the first laptop that had a TFT screen the first modern LCD screens. It was the first laptop that pushed the keyboard up, creating palm rests and had an integrated pointing tool, in this case a trackball." Amazingly, we're only just over six minutes into this presentation but Jobs has primed us to think that Apple is the best mobile devices company in the world and also the best at making laptops. And finally, it was here. "A question has arisen lately," said Jobs. "Is there room for a third category of device in the middle? Something that's between a laptop and a smartphone. The bar is pretty high. In order to really create a new category of devices, those devices are going to have to be far better at doing some key tasks. They're going to have to be far better at doing some really important things. Better than the laptop. Better than the smartphone." He sketched out some tasks like browsing the web, doing email, reading. "If there's going to be a third category of device, it's going to have to be better at these kinds of tasks than a laptop or a smartphone. Otherwise it has no reason for being. Now, some people have thought that that's a netbook. The problem is that netbooks aren't better at anything." He dismissed netbooks for their lack of speed, lack of quality and poor software. He said they're "just cheap laptops and we don't think that they're a third category of device." And then he said "But we think we've got something that is and we'd like to show it to you today for the first time. And we call it the iPad." It's as well that Jobs had done all this work positioning the iPad because just about the instant that slide appeared, so did the first criticisms of the device. The very first criticism, though, was valid. It was about the name iPad. Among many references online to Maxi-Pad tampon and among Twitter references to #iTampon, there were criticisms that clearly no women work in Apple's naming department. Fast Company's Alissa Walker or perhaps her headline writer said it best, though, in a piece called "Apple's iPad Name Not the First Choice for Women. Period." If you got an original iPad when it actually went on sale in April that year, your first reaction was surprised at how small it was. Then after a few minutes of using it, you tended to forget that and even come to think the opposite. Seeing a full website page at a time did feel like, as Jobs said, "holding the internet in your hands." The majority of critics did not wait to get one, did not wait for it to go on sale, before they were pronouncing the iPad a certain flop. Business Insider called it "a big yawn" and a disappointment, saying that Jobs "didn't deliver." InfoWorld didn't even wait for the announcement, let alone the product, before it went a bit crazy with the idea of a "coming Apple tablet-pocaplypse." Written for IT professionals in corporations, it advised "an outright ban [on the iPad] is in order." It even told them to make any excuse they liked but ban the iPad and "seek to contain the situation by offering up an alternative tablet solution running the IT-supported and IT-approved Windows 7 operating system." John C Dvorak was always more of a clickbait and shock-jock style of pundit but he at least waited until the announcement, even if he didn't see an iPad himself. Still, he reckoned it was a serious misstep. "I'm of the opinion and hope that this device is only released as a market test and placeholder for something more spectacular in the future," he wrote. If Dvorak's notion of a market test was bizarre for a business writer, you could say that he was right that something more spectacular would be coming in the future. Despite the critics, despite being late to the whole idea of tablets, Apple made the iPad and we bought it in our millions. It's had some ups and downs since that 2010 launch but it's also got progressively more spectacular. You've seen how shockingly huge the bezels on the original model now seem to us. Here's another way to see the difference between then and now. The main image is a home screen from the current 11-inch iPad Pro. The two devices have slightly different dimensions. The original iPad was 9.56 inches by 7.47 inches and the 2018 model is 9.74 inches by 7.02 inches. However, look at the inset image. That's the home screen of an original iPad and it's rendered here to scale. This is how far just the quality of the iPad screen has come since January 27, 2010, when Jony Ive said that the iPad was "magical". Steve Jobs said that Apple believed it had found a third category of device, one that fit between a phone and a laptop computer. It did, and in the nine years since it shipped that first iPad to customers, Apple has released twenty different models of this slate device. Is a jailbroken 1st gen iPad usable as a weekend device(1 to 2 days a week)? In a lot of ways, perhaps Jobs vision or market segmentation for the iPad, a device that sits in between a smartphone and laptop, became more of a ball and chain than a computer for everyone. Hard to explain why they limited the functionality of iPads for so long, and still are going a snails pace. They should have sprinted head long into having iPads do everything a computer do. instead of it being an iOS device for a 10” display, it should have been iPadOS, capable of doing everything a computer can do. Mind that I’m all in with using an iPad flat on a table like a piece paper. Hardware keyboard support is nice, but it shouldn’t be advertised with it. That model was tried for decades before the iPad arrived and it failed. Even now MS is still trying that with the Surface and it still has no marketshare compared to the iPad and even less when you look at Windows installs. The iPad's OS being idealized for the device and I/O is the reason for its success. Felt the buzz buying Sinclair's QL, looking at the Macintosh, buying a NeXTStation and certainly felt it buying the first iPad. So basically you want macOS on an iPad...that doesn't work and Apple has explained this many times. Seems like people just don't want to listen. Just look at the Surface Tablet. Yeah Microsoft is selling some and sales to go up sometimes, but as @Soli said, they don't have anywhere near the marketshare of iPad and that trend continues. So I think the market has decided what works best. "That model was tried for decades before the iPad arrived and it failed. Even now MS is still trying that with the Surface and it still has no marketshare compared to the iPad "
Disagree. What MS is trying to do is shove two different UI paradigms (GUI & multi-touch / stylus) onto one device. That's a mistake. What Apple, at least to me, should do is keep adding capabilities to iOS to the point where one doesn't need macOS, so that all of their devices from wearables up to desktop are based off iOS (multi-touch / Pencil). "So basically you want macOS on an iPad"
That is not what that person said. I want macOS on the iPad when the iPad is docked in to a keyboard with a trackpad. When undocked, it should be an iOS device. The device would replace the iPad Pro / MacBook / MacBook Air and cost under $1,500. Apple could call it macPad. The macPad could serve most students and be used for non-task-intensive professional applications at work. The MacBook Pro would continue to be a macOS-only device, run on the Intel architecture, and cost north of $2,000 all the way to $5,000 (depending on specs and screen size). 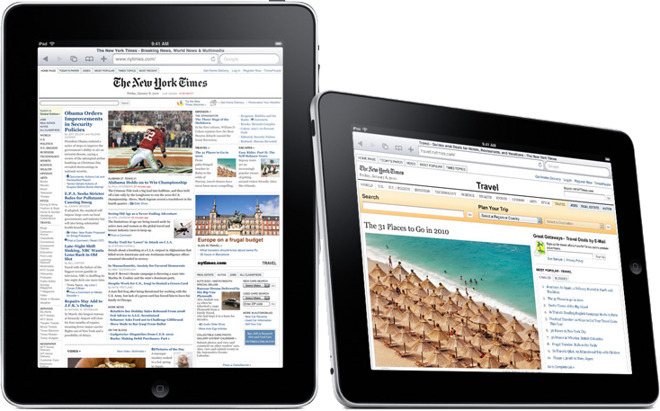 The non-Pro iPad would remain iOS only and be mostly a content-consumption device. It should be under $500. When Apple came out with the Mac in 1984, it was sold alongside the Lisa until it become capable enough to the point where it cannibalized its command-line based computers. iOS should take the same trajectory => be capable enough to the point where it can cannibalize macOS while staying true to its multi-touch / Pencil UI paradigm. You can disagree all you want, but it's not an opinion. That model has never been a success. Despite MS' massive marketing push for the Surface tablets to obtain the 2nd highest tablet mindshare they still don't show up on charts of actual tablet sales—they're regulated to lumped-in, Other category because they just don't have the numbers to even be broken out along all the tablets being sold. Even Amazon gets broken-out with their tepid Fire tablet. It absolutely is. If you say you want a car that can do everything a speedboat can do then you don't want a car that is designed to be a great car no matter how much you argue that you don't want a speedboat. You can't have it both ways and he clearly stated that it wants it to do everything a PC can do. Now, if one were to say that they wish the iPad has certain features that are available on MacOS then that's a very different argument. For example, if I said that I wish that the iPad offered a dual OS GUI (à la iOS for iPhone with CarPlay OS when connected to an applicable automobile) for a desktop-like experience when connected to an external monitor with a mouse and keyboard then that's a very different discussion because it's specific and in no way implies some ridiculous "everything" qualifier. PS: You can't even use the "everything" statement when you're talking about PCs covering a span of years. I want more control over my internal storage in my MBP and I want better security and protection for my data. I could've kept my old MBP but I leaned toward better security so the T2-chip in my new MBP is what I settled on. I can't have it both ways. The same goes for all sorts of components. Do I want a better display and faster Mac or do I want cheaper and easier components if I need to repair it? How about faster USB ports over an abundance of USB accessories? Would I like a serial port instead of adapters and buggy drivers for connecting to old routers or do I want to just keep using a laptop so antiquated that it still has a serial port? We make these decisions all the time and this will not change for technology. That model was tried for decades before the iPad arrived and it failed. Even now MS is still trying that with the Surface and it still has no marketshare compared to the iPad. What Apple did by making an OS that is idealized for the device and I/O is the reason it's a success. Oh, but I don’t think of Surface slates as tablets. ;j They are basically laptop computers for the vast majority of users save for the pen artists. I’m all in with using the iPad with only the software keyboard, flat on the table; and, using the stylus for drawing input. I want an iPad to be a paper replacement, capable of doing all the things that can be done with paper, with touchscreen as the primary input. A hardware keyboard is an impediment to that. iOS on a 10” display has gotten as far as it can go in terms of unit sales, no? Nice peak of ~75m units in 2014, but it’s found equilibrium of about ~45m units now for the past 3 years or so. How does Apple get more iPad sales? Take Kindle sales away and be the ebook reader of choice? (Tried and failed for various reasons). Looks like there will be another go around with Apple News+Magazines+Books subscriptions this year. Then, the textbook option seems to have been abandoned, but perhaps that’ll make a comeback as Kindle doesn’t really compete there. I don’t think their push for iPads in schools is a push for dominance. It’s more trying to carve a creative niche. I think they can asymmetrically attack this market by replacing paper-based materials (homework/study sheets, books, source materials) and providing a way for teachers to get them on iPads, students use a stylus to do them (and software keyboard for typing), and have them graded and recorded through software. They know they won’t go the cheap laptop route, so push where laptops can’t go. Perhaps futile? The iPad has a pretty good push into the pay terminal device. Push more and make Apple Pay usage with them automatic. Skim off the financial side. Then, they can still take sales from the PC market. Make a 15” version. Have multiple USBC and or TB3 ports, implement more software features etc. A whole historical feel good break down that is interesting to browse for a few paragraphs but ultimately it isn’t an apples to apples comparison. It like saying the iPad is much better when compared to telegrams! Microsoft has moved on from Balmer into the cloud and on a short term share basis at least is the most profitable company in the world right now. Microsoft doesn’t care about a saturated cell phone market or if someone on this forum buys a Surface or not. Under Nadella they seem to be making smaller bets on companies they buy and have not gone headlong into self driving cars, production companies, health and music. Apple is a minor competitor in this world with Amazon, Google and IBM their biggest competitors. A computer can do everything by definition. So thats why its called an iPad. an electronic device for storing and processing data, typically in binary form, according to instructions given to it in a variable program. • a person who makes calculations, especially with a calculating machine. My iPad 2 has gotten to the point where it's not really usable anymore. I don't know if the hardware has decayed or the software has just gotten more demanding or both, but even with older apps it seems a lot slower than it used to. Sometimes I wonder if I should've stayed on an older version of iOS instead of upgrading. iPad 2s are totally useable. You should reset it(wipe its OS) and start from new . My one (not jailbroken) still runs Netflix and also iBooks are fine, but otherwise, System 5 is just outdated. It can't even play Apple Music. Kids used it to play some games, until I bought them 2018 iPads. However, hardware-wise it is still in great condition - can't believe I bought it on Christmas 2010! Now it spends its time in drawer, with old good Palm Tungsten E and other forgotten stuff. In order to really create a new category of devices, those devices are going to have to be far better at doing some key tasks. They're going to have to be far better at doing some really important things. Better than the laptop. Better than the smartphone." Jobs’ vision was that it would be better at some key tasks. Same, but different. Leading to better. Personally, the iPad Pro is my main portable device, because it is better at portability. I just wish it had a great file management system that plays well with MS servers. Then it would be perfect.